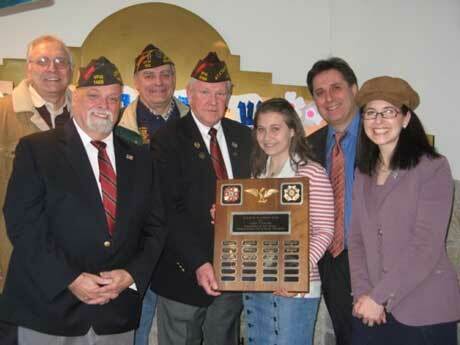 Ariela Rivkin, an eighth-grader from Yavneh Academy, captured first place in the statewide Patriot Pen essay competition sponsored by the Veterans of Foreign Wars. The Teaneck resident beat out 12,000 competitors from around New Jersey to win the annual contest and is up for the nationwide title. Veterans and members of the local VFW came to Yavneh to honor Ariela at a ceremony last week and presented the school with a plaque. As a top winner, she was awarded a $1,000 savings bond. Ariela didn’t have much time to contemplate the topic because she only discovered the contest during an online search several days before the deadline. Luckily, she knew exactly what she wanted to say: that America can honor its veterans only when people have a fuller understanding of the sacrifice they have made. “Before asking ourselves when to honor our heroes, we must determine how to honor them. I believe real honor means making sure that we and future Americans know and remember what they did for us. To me, honoring means understanding and appreciating,” she wrote in her essay. Patriotism is “something that my whole family feels strongly about and we talk about stuff like this all the time. This country and its heroes and its future is something that’s been a high priority at my house,” she said. Ariela learned in November that she had won the local competition and later that she won the district race. At the state VFW dinner two weeks ago in Cherry Hill, which was attended by members of 21 districts, Ariela’s statewide title was announced and she read her essay aloud before the crowd. Ariela said she was particularly touched when one of the veterans presented her with one of his own “challenge coins,” typically awarded to soldiers for outstanding achievement on the battlefield. Yavneh Principal Rabbi Jonathan Knapp, who recited the prayer for the American military at the school ceremony last week, said, “We are proud of Ariela’s unique accomplishment.” Leonard Hennig, the commander of VFW Post 1429 of Teaneck, and William Thompson, a senior vice commander of the state VFW, spoke at the ceremony, where Ariela read her essay for the Yavneh students. “It was a great honor for our school to host the program and shine a spotlight on honoring our local veterans,” said Knapp. Hennig said that Ariela’s essay speaks right to the question of how to best honor our heroes.